On a recent trip to Costa Rica to commission a new biochar kiln, IBI board member Stephen Joseph visited a biochar compost facility along with Gabi Soto of the Center for Tropical Agriculture Research and Teaching (CATIE) and other colleagues. This is their report. Two decades ago, a volunteer from Japan named Shogo Sazaki brought a powerful combination of technologies to Costa Rican farmers: bokashi and biochar. Bokashi is a compostingsystem that uses an inoculum of microorganisms known to improve soil health called EM (Effective Microorganisms). Biomass and minerals are reacted with the microbes to make bokashi. Adding biochar to the bokashi mix provides habitat and support for the microorganisms. It’s a winning combination, producing a superior fertilizer for organic farming. 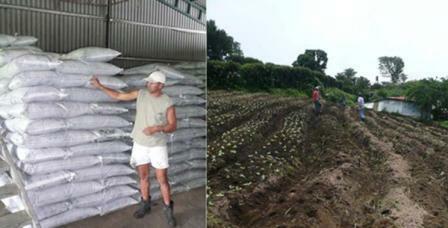 Today, Henry Guerrero of Coopebrisas is in charge of an active program developing new mixtures and improving the process. Henry is the president of an Organic Farmers Association (APODAR) with 26 members who supply the main supermarket chains with organic vegetables. All the farmers have been using bokashi for their organic production for the last 15 years. Productivity using these organic methods is comparable to the productivity of conventional farms, and the technology is spreading to other Central America countries. 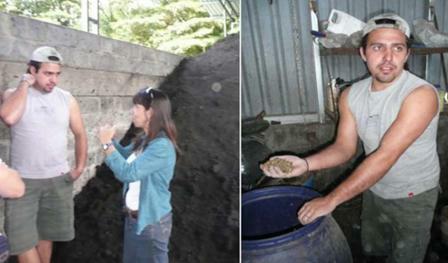 Photos: The biochar-bokashi factory in Costa Rica. A worker shows visitors a handful of fermenting Mountain Microorganisms. Char used in the process comes from bagasse that is converted to char in a sugar mill by inefficient combustion in a simple furnace. The bagasse biochar smells sweet and has a neutral pH indicating a low production temperature. Microorganisms are a mixture of the Japanese EM augmented with local microbes using litter taken from a nearby mountain forest and fermented using a molasses substrate mixed with rice polishings. These microorganisms are known as MM (for Mountain Microorganisms). Henry Guerrero said that the EM works faster than the MM but the MM has a greater effect on plant and soil health, so both are mixed in a 1:1 ratio. 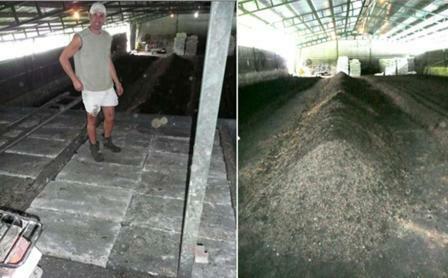 Photos: The anaerobic covered pit at the bokashi-biochar factory. The pile of aerobic compost. The process has a number of steps. First the ingredients are gathered and mixed on the floor of the factory: fine biochar from the bagasse furnace; chicken manure (previously treated with MM); cow manure (previously treated with MM); rice husks; rock phosphate; molasses; and calcium carbonate (added at the end of the process). The mixture is placed in a concrete lined pit and covered with plastic, and concrete blocks are then placed on top of the plastic. A person walks — “pilas”– on top of the covered pit, to ensure that anaerobic conditions are maintained for about 10 to 15 days. The material is then taken out of the anaerobic pit and spread on a large floor. A mixture of the EM and the MM are sprayed on the material and then it is composted aerobically for a period of approximately 20 days. A small rotary tiller is used to aerate the pile. The material is bagged in either 1 kg or 17 kg bags. The composition on the bags is N 1.6%, P 1.4%, K 2.7%, Mg 1.4%, Ca 8.81%, Zn 393.75ppm, Co 8 ppm, Fe 8.16ppm, Mn 620ppm, Organic material 32.3%. Application rates are also given for various plants ranging from 1.5 to 3 tonnes/hectare. Photos: Bagged biochar-bokashi, ready to use. Henry Guerrero’s vegetable garden feeds 6 families.